Happy Giving Tuesday! We hope you celebrate #GivingTuesday with us by donating to the causes you care about, including Bay Area Disc! We’ve identified more than 100 Bay Area employers (such as Google, Apple, LinkedIn, Wells Fargo, Cisco, Kaiser Permanente, Genentech) that are willing to donate a “matching” amount when their employees give to 501(c)3 nonprofit projects like Bay Area Disc. This is a smart and simple way to DOUBLE YOUR DONATION! Inquire within your company to find out if they match donations (a partial list is available on our website), and how to make a matching a donation. Bay Area Disc can help you work magic with your stock donations, as long as they have been held for more than 1 year and are positive gains. Since we have 501(c)(3) nonprofit status, we pay no taxes on your stock gift, and you may avoid capital gains taxes and maximize your income tax deduction. The tax benefits can vary based on your tax bracket and how long you’ve owned the stock, so please consult a tax advisor in addition to reading our Stock Donations page. 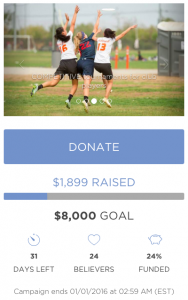 Bay Area Disc has launched its first crowdfunding campaign, the Challenge Fund, and it won’t be our last! Several major donors pledged to match up to $8,000, challenging the Bay Area community to reach that goal. We are already planning for our next crowdfunding campaign, which will launch soon (spoiler alert: it will focus on coaching, and we have already locked in matching donors!). We hope our supporters find that these new avenues for donating make it easier and more exciting to donate to Bay Area Disc. Please feel free to get in touch with me (mike.mcguirk@bayareadisc.org) with any thoughts or questions about Giving Tuesday and/or donating to Bay Area Disc. This entry was posted in Adult Rec Ultimate, Club Ultimate, Youth Ultimate by Jesse White. Bookmark the permalink.